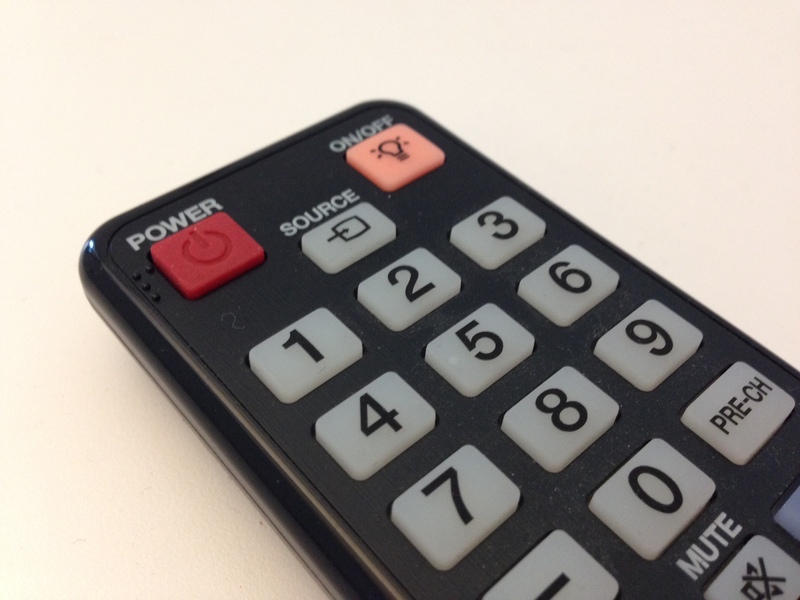 This remote has two buttons, in shades of red, in key positions at the top of the remote. The one on the left is labeled “POWER” while the one on the right is labeled “ON/OFF.” To a remote novice like myself, my first instinct was to press the “ON/OFF” button to turn the television “on.” Makes some manner of sense, right? After several failed attempts, I was forced to turn to a fellow co-worker and ask WTH? Turns out, the “ON/OFF” button is to turn the button lights “on” so they’re visible in the dark. (!?!?!?!) Lesson learned, but I still question the: 1) size 2) relative position and placement 3) use of color 4) and labeling applied to the Power and the On/Off buttons. It seems the On/Off button could be given a little less prominence, a different color, and don’t we have technology to make them glow in the dark or react accordingly with sensors?